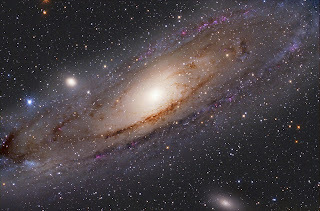 According to new research published by scientists at the University of Michigan (UM), the Andromeda galaxy, the Milky Way's closest large galactic neighbour, merged and cannibalized a massive galaxy about two billion years ago. The decimated galaxy, known as M32p, would have been the third-largest member of the Local Group of galaxies, after the Milky Way and the Andromeda galaxies. Through new computer simulations, it was shown that most of the stars in Andromeda's outer faint halo were mostly contributed by the shredding of one large galaxy. The merger may also explain the thickening of the disk of the Andromeda galaxy as well as a burst of star formation that occurred about two million years ago. The method utilized by these scientists can be applied to other galaxies, allowing researchers insight into the largest galactic mergers in the universe. With these results, scientists can gain a better understanding behind the driving forces of galaxy growth and learn about what mergers do to galaxies.